Christmas means… Christmas is… Hopes fulfilled, dreams to come! Christmas defines who we are as we relate to each other—to our family, friends, schoolmates, workmates and other people in our lives. What does Christmas mean to you? It’s the season of giving, peace, and love. Christmas is filled with traditions, from gifts wrapped under the tree to mistletoe hung in the doorways. Christmas used to be an annual festival held at churches to commemorate the birth of Jesus Christ. Now, when the word Christmas is mentioned, people think about presents, lights, trees, food, family, and friends. As we celebrate the holidays, we are passing down the traditions to the next generation. They are the ones who will keep the Christmas spirit alive in the future. Teens today view the holidays as a reward after completing another stressful half of a year in school. During the holiday season, they are able to thank their friends and family whose continued support and love keeps them inspired while they study. The celebration of giving, and the celebration of family and friends are not really new but they are new in that today they are what defines Christmas. “Family, Joyful, and Magical.” This is what Katrina Tolentino describes her Christmas experience every year. One of her favorite Christmas memories is going to Las Vegas last Christmas and ice-skating for the first time. She was very inexperienced and was scared of falling. “I held on to the wall 99% of the time that I was on the skating rink” she said. 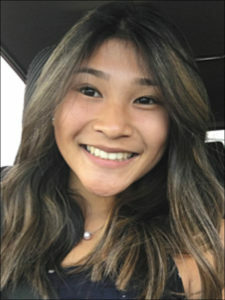 It was also the rest of her family’s first time ice-skating, “so it was funny to see all of us holding onto the wall for dear life.” Katrina would definitely rather spend Christmas in the snow because “in Hawai‘i we don’t get snow—only every once in a while at the peak of Haleakalā.” Since her family spends most of their holidays in Hawai‘i, it would be nice to spend it somewhere where it snows. Christmas has a special place in Katrina’s heart, it’s the time where she can spend time with family. A lot of families, including her own are very busy throughout the year. Christmas is the one day they can all spend time together. Her mom usually makes pancit or Filipino desserts to celebrate. Some of her favorite Christmas traditions are going with her family to church in the morning and then returning home to open presents. Later at night, her whole family, including aunties, uncles, grandparents, and cousins have a get-together at one of her family member’s house. “There, we eat lots of food, exchange gifts, and sing karaoke” she added. To Louise Dantes, Christmas means a time of pure bliss. Once December 1st comes around, she is instantly hit by excitement. She enjoys shopping and wrapping gifts for her family and friends during this time. “I prefer giving presents rather than receiving because knowing that I made someone happy already satisfies me and I wouldn’t have asked for more,” she said. What Louise enjoys the most about Christmas is the joyful spirit it gives out, not only to herself but also to those around her. “I love the hype leading up to it. Whether it would be through setting up a Christmas tree, shopping for friends and family, baking, making gingerbread houses, opening advent calendars, or watching Christmas movies,” she added. Just thinking of Christmas makes Louise the happiest. Her holiday season revolves around her family, being merry, and experiencing euphoria. One of her favorite Christmas memories is celebrating in the Philippines in 2016. “I have never felt the spirit of Christmas as much as I did there.” Louise hadn’t celebrated Christmas with so many of her relatives before and seeing everyone so grateful and happy, even by the smallest things, made her realize what Christmas really means. Christmas is really hyped in the Philippines and she remembers attending church around 4 a.m. in the morning. If Louise could ask Santa for one gift, it would be a round trip ticket to Italy. “I want to visit my grandma and to explore the country’s beautiful streets,” she added. 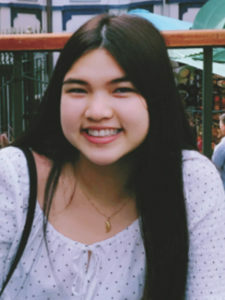 Katrina Rabang believes we need more humanity in this world especially because of the amount of negativity and cruelty that people around the world are experiencing from others. This is why for Christmas, if she could ask Santa for one gift, it would be everlasting world peace. She prefers giving rather than receiving because she enjoys seeing the smiles on people’s faces after they open their gift from her. “I also don’t like to ask for much because I’m grateful for what I already have,” she said. Katrina uses the three words: festive, heartwarming, and joyful to describes Christmas. She celebrates Christmas because not only is it her favorite holiday but since her family is very religious, they celebrate it in honor of the birth of Jesus Christ. 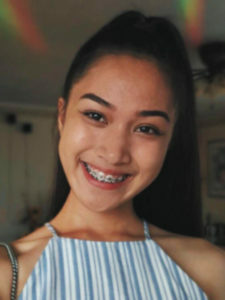 Every Christmas, her family would go to mass in the morning and have a family gathering at night where they would play games, open gifts, and spend time with one another. Some of her Christmas traditions also include spending time with her Life Teen group at Church. 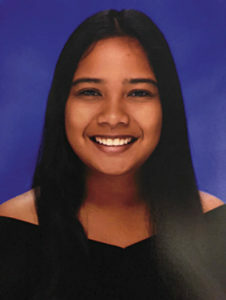 As much as Romelyn Tabangcura loves Hawai‘i, she would rather spend Christmas in the snow. “I think it would be an amazing sight to see snow fall and make snow angels and snowmen with my family and friends,” she said. Romelyn celebrates Christmas by decorating the house with a Christmas tree and stringing Christmas lights around their property. Their family gathers to eat and exchange gifts. She enjoys Christmas because everyone is in such a happy mood. She spends her holiday season watching Christmas movies and listening to Christmas songs with her siblings. Rockin’ Around the Christmas Tree is her favorite festive song. Besides the lyrics being very catchy, the song puts her in the Christmas spirit. Christmas to Romelyn means a time of giving and being thankful for everything that she’s have been blessed with. Her favorite Christmas memory is when she was in the Philippines and her family would gather around and make food together. It was nothing extravagant like how we celebrate it now here in the United States where we exchange presents but it was still very special to her. 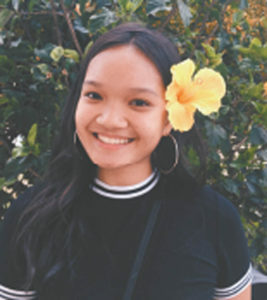 When it comes to receiving or giving gifts, Romelyn prefers giving presents because she loves shopping for people and later seeing their reaction when they open the gifts. “I think the feeling of giving back to someone you’re thankful for is much more special than receiving a gift,” she said. Cheyenne Magno describes her Christmas as festive, merry, and all about family. What she enjoys about Christmas is that the whole month is basically a never-ending holiday for her family. Four out of five of her family members have birthdays in December so there’s basically a party every week. Cheyenne celebrates Christmas with family to honor the birth of Jesus Christ. Along with her family, they try to spread as much Christmas cheer as they can by decorating the outdoors with inflatables, lights, reindeer, and other decorations. One unique Christmas tradition that the Magno family does is to prank each other with unusual gifts wrapped in deceiving wrapping. On one Christmas, she received an “iPad” from her older brother. However, when she opened the box, she was crushed to find a book. “I would rather spend Christmas in Hawai‘i because I’m not really a big fan of the cold,” she said. To her, Christmas means loving, receiving, and giving. “Christmas gives us the opportunity to share the extra special moments with our family while we have them and to be appreciative for what you have,” she added. If she could ask Santa for one gift, it would be to see her grandfather for one last time. He died when she was at a young age so Cheyenne didn’t really have the chance to meet him properly so it would be great to hear his voice again. “Love, Unity, and Wholesome.” This is what Gabrielle Pastor describes her Christmas experience every year. She enjoys seeing everyone’s Christmas decorations and the thought of spending time with family for the holidays. Gabrielle also loves going out to buy presents for her friends and loved ones because it’s the perfect opportunity to give back to them and share the Christmas spirit. She also enjoys watching Christmas movies during the winter and her favorite movie to watch would be Home Alone 2: Lost in New York. She’s always wanted to travel to New York and see the tall buildings, especially in the winter when it’s freezing! However, she believes that Hawai‘i provides the perfect weather during the holidays. 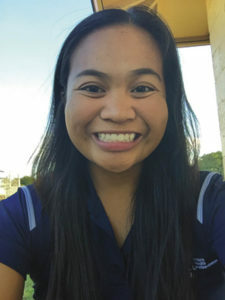 “I would rather spend Christmas in Hawai‘i because with the one season that Hawai‘i has, there is a very, very small chance of being stuck in a blizzard and having to spend Christmas alone because the roads are blocked with snow,” she said. Gabrielle celebrates Christmas because it’s a part of her religion and family tradition. They celebrate Christmas by attending mass at church and having a family gathering. One family tradition they have is playing the game White Elephant at parties. One of Gabrielle’s fondest Christmas memories is helping her Mom put the lights up on their Christmas tree. “As a child, it was a tiring task because of how large the tree seemed to me. However, when the final string of lights was wrapped around the top of the tree and we plugged it in, like the tree, my eyes lit up and I felt happiness like no other,” she added. Her grandmother recently moved to the Philippines and she misses her especially now that Christmas is approaching. If she could ask Santa for one gift, it would be plane tickets to the Philippines for Gabi and her family. Christmas is the time of giving and receiving. It also means being with family during the happiest time of the year. 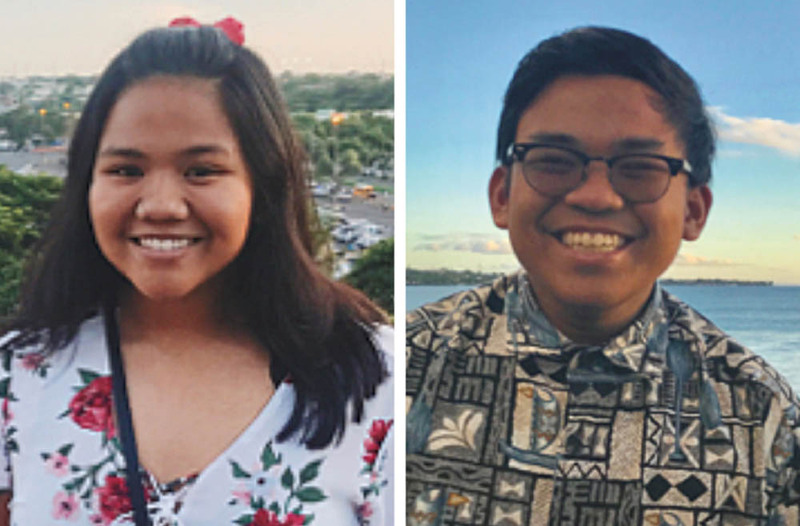 However, the siblings would rather spend Christmas in the snow because they’ve experienced Christmas in Hawai‘i for the last sixteen years and really want to experience and do any type of winter activities in the snow like what people in the Mainland would do. Jeannine Miranda celebrates Christmas to laud the birth of Jesus. It’s also a time to give back to people which she thinks is very nice. She celebrates Christmas by going to the midnight mass at her church. “I also put up decorations around my house and get gifts for close friends and family,” she added. On Christmas, her family usually goes to her Uncle’s house to have dinner. One of her family traditions is to open their gifts on Christmas morning but on Christmas Eve, they’re allowed to open one of their gifts. Jeannine describes Christmas as joyous, loving, and filled with laughter. Joyous because Christmas brings happiness; loving because it’s about giving and spending time with family. Lastly, laughter because she’s always laughing or smiling during Christmas time. Christmas is a time to give back to people or the community. “It also means getting together and enjoying each other’s company; being thankful,” she added. When it comes to Hawaiian weather, Jeaninne would rather spend Christmas in the snow. A change of weather would be nice for her. She also wants the experience of wearing layers cause that’s not really necessary here in Hawai‘i. “I’ve never been in snow before and it’d be really exciting to spend Christmas in the snow,” she added. 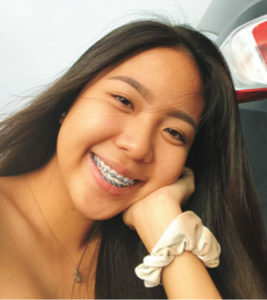 “Filled with love.” Nicole Rabanal used these words to describe her Christmas. To her, the meaning of Christmas is simply to give back to other people and to show love. However, as much as she likes giving people presents, she prefers receiving because it warms her heart knowing that people would be so thoughtful to give her a present. Another reason why she prefers receiving is because she loves hearing the story on why people gave that gift. “You’ll never see someone sad about their gift because it’s the thought that counts and not the materialistic thing that they actually get,” she said. This is what Nicole enjoys about Christmas, seeing everyone together with smiles on their faces. This is the time when people forget about their problems. She celebrates Christmas because she’s Catholic and December 25th is when Jesus was born. When she lived in the Philippines, she went caroling with her friends from house to house starting on December 16 up to Christmas Day. Nicole would go to her Ninongs’ and Ninangs’ houses and they would give her this red Chinese envelope with money inside. 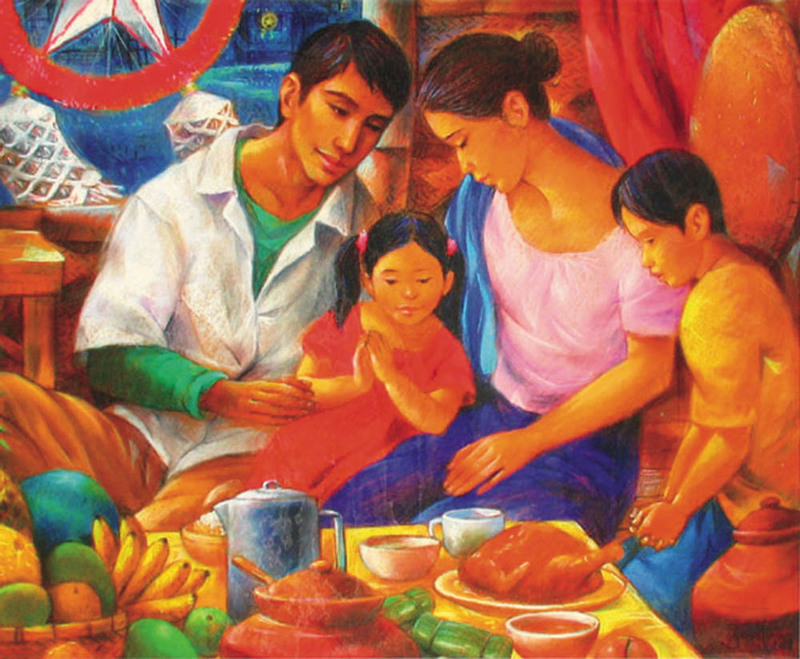 A family tradition she always does annually is called Noche Buena. This is the time when their whole family gets together on Christmas Eve and eat. If she could ask Santa for one gift that would be a house. “I want our family to have our privacy and it’s just something that would make not only me but also my parents happy,” she added. Christine Alonzo says that Christmas is the “Season of giving.” If Christine Alonzo could ask Santa for one gift, she would ask for money. Even though that may seem greedy to most people, she would not be greedy with the money at all. Christine believes in the saying “Money doesn’t buy happiness” but she also believes that you can use the money to create happiness. 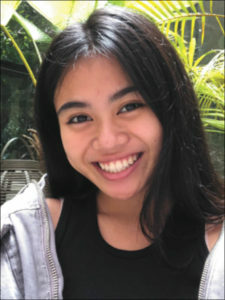 “If I received the money, I would give it to the less fortunate to make their holidays a little more joyful,” she said. She prefers giving rather than receiving because the look on people’s faces when they receive something is priceless. Their faces light up and that warms her heart. Christine celebrates Christmas because she grew up learning that Christmas is Jesus’ birthday and that it’s the season of giving. On Christmas Eve, her whole family gets together at one of her relatives’ home and they all stay up until midnight to say “Merry Christmas” to each other. A few family traditions include having a Christmas dinner and playing White Elephant. The one thing she absolutely loves about Christmas is the joy it brings. “Whenever Christmas comes around, I notice that a lot of people are more joyful and happy,” she added. Her favorite Christmas memory is arriving in Australia on Christmas day and seeing her relatives for the first time in a long time. Christine’s family traveled to Australia last year on Christmas Eve. “We were so happy to be with them and that was something I would never forget,” she said. 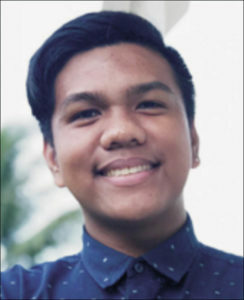 Kristian Magaoay describes Christmas as being “Merry and Bright.” He enjoys Christmas because of the cheery holiday spirit—everyone getting together and having the time of their lives. “I celebrate Christmas because it’s that time of year where you get together and bond, giving each other gifts and making everyone happy,” he said. The way his family celebrates Christmas is by having a little family get-together. They give each other presents and just have a little party with food, drinks, games, movies, etc. “Our family tradition is usually just a Christmas party with tons of people coming over and food,” he added. Kristian would rather spend Christmas in Hawai‘i because most of his family is here. “It would be nice to experience it in the snow but it’s more about the bonding of one another,” he said. He prefers giving rather than receiving because seeing friends and family smile when they receive gifts is probably the best thing you could ever see. Giving friends and family gifts and seeing them smile and be really happy when they open them warms his heart. “In all honesty, I wouldn’t even ask Santa for one gift because just the fact that I’m able to spend time with my family and making most memorable moments with them already makes me happy,” he added. 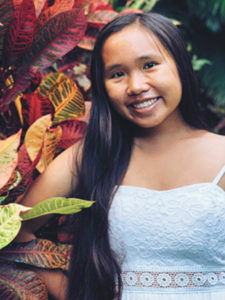 As much as Shmily Versola loves Christmas here in Hawai‘i, she would want to experience the cold weather. “I want to see what a white Christmas looks like and also build a snowman,” she said. “Christmas is the most wonderful time of the year. It is the most awaited day as the year finishes.” What she loves about Christmas is seeing her family come together as one. No fighting. No yelling. No worries. “It’s just us. We gather as a celebration of the love we have for one another,” she added. Shmily celebrates Christmas as part of her religion. “That is when our savior Jesus Christ was brought into this world,” she said. One of her family traditions is to have a feast on Christmas with all of their favorite dishes, cooked and served with love. They play games and talk to catch up with each other’s lives. “A family tradition we have is always serving spaghetti on Christmas Eve. We can never forget about spaghetti,” she said. Shmily’s all-time favorite Christmas memory was when she was five years old. It was her first boodle fight. Her family decided to spend Christmas with her maternal grandparents. She remembers having the food arranged nicely but after the prayer was finished, everyone was digging in. Her Dad tried his very best to grab as much shrimp as he could because they were Shmily’s favorite. To Shmily, giving is better than receiving because it makes her feel good about herself. It’s the thought that she gets to make someone smile even for a short amount of time that brings her joy. If she could ask Santa for a gift, it would be the gift of having the chance to change the world. She chose this gift because many people are fighting their toughest battles, crying out for help around the world but nothing ever happens. No changes are being made. No one is taking the time to seek for improvements. “Time may not be our friend at all times but it should not stop us from moving with purpose,” she added. The holiday season is the reward teens have been looking forward to after completing a semester in school. They are able to give gifts to their friends and families as a symbol of their love and appreciation for their support. During the holiday season families gather together to enjoy each other’s company. Christmas is the perfect celebration filled with presents, lights, trees, food, family, and friends. The birth of Jesus Christ is what’s usually associated with Christmas or the holidays but generations have been redefining Christmas in their own way. As we celebrate the holidays with our families, young siblings, cousins, or children, they’ll witness the magic of giving and love—they are the ones who will keep the Christmas Spirit alive in the future. The celebration of giving, and the celebration of family and friends are not new but they are new in that today they are what defines Christmas. 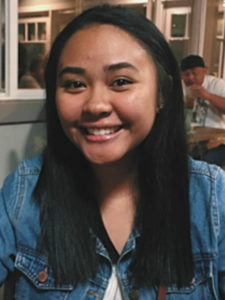 Ghenesis Jhay Balaan, is a Junior at Maui High School attending its Culinary and Health CTE Pathway. 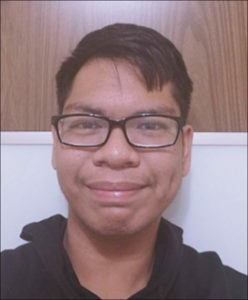 He is a two-year member of Health Occupations Students of America (HOSA) and served as its Council Treasurer in 2017–2018. Ghenesis hopes to become a respiratory therapist in the future. He is the eldest son of Benjamin V. Ballesteros Jr. and Jerameelyn B. Ballesteros.